The popular strategy series makes its grand entrance on iPhone, and sooner than we expected. The team at Aspyr certainly understands their Civ. 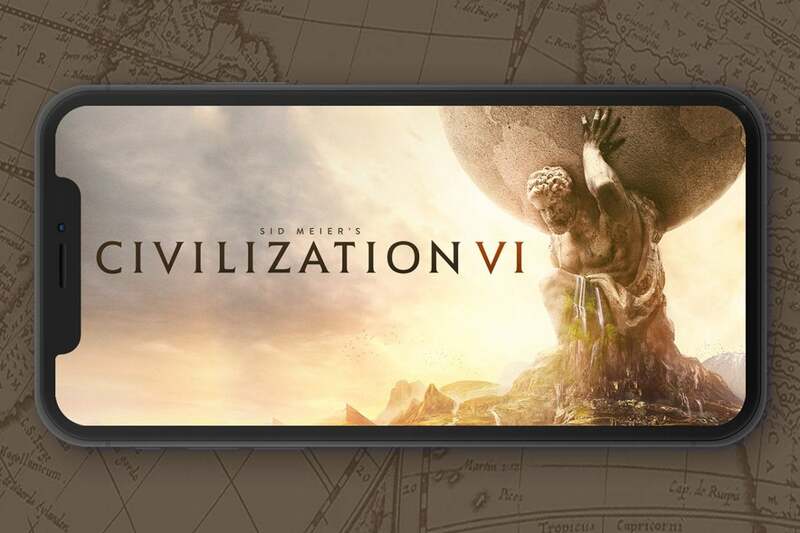 While I had my attention focused elsewhere, they advanced so far down their technology tree that they managed to stuff a game as complex as Civilization VI on the iPhone and make it look as though it belonged there all along. If this were a game of Civ, I would have figured such a feat would have taken them a few more turns. After all, it was only a little over a year ago when my jaw dropped at the sight of Civilization VI running on an iPad; its complex mouse-and-keyboard controls brilliantly translated to Apple’s language of taps and swipes. But that’s the little leagues compared to what I’m seeing here. I can build empires on the subway. I can usher in great ages of science on the sidewalk to work. And for the most part, at least with my iPhone XS Max, I’m preferring this version over its counterparts on larger-screened devices. But first, an introduction. Civilization is the quintessential "4X" game: a strategy genre focused on "Exploring, Expanding, Exploiting, and Exterminating." Typically, Civilization and other 4X games have focused on exterminating your rivals (either with real players or through the A.I.) by military might, but Civilization VI also allows victories based on scientific or religious grounds. You spend a lot of time maneuvering over the increasingly cluttered tiled world map, and for years players assumed these graphical and interactive demands would mean Civ would remain restricted to the PC and Mac. Last year, though, Aspyr proved these controls work almost as well with touch-based gestures on the iPad. In fact—and some may call this blasphemy—sometimes they seem better. This is largely true of the iPhone, too. This is essentially the same game you’d play on the iPad, although it comes with a few design changes to accommodate the smaller screen. On the iPad, the changes from PC to tablet chiefly amounted to bigger buttons (and a massive battery meter), but here Aspyr significantly modified some elements while keeping them in their expected locations. The focus, rightly, is always on the map itself, which sprawls beautifully across the screen of my iPhone XS Max. Everything else, though, is smartly in reach. The civics and technology trees? You’ll find through in small, circular buttons with familiar icons in the upper-left corner. Once open, they look much as they do on larger screens. Need to find maps for resources? Press the little slider in the lower left. If you want to see how you’re doing regarding the various victory conditions, click on your leader’s icon in the upper right. This version even comes with some iPhone-focused shortcuts, such as the way you can close a menu by tapping the screen with three fingers at once. Unlike on the iPad, the icons take up no more space than they need to. The battery icon isn’t so intrusive anymore. The "Next Turn" button no longer looks as big as the moon: It sits resting in the lower right-hand corner, always at the ready but never in the way. I like this. In some ways I like it more than the iPad version. But I realized early on that I feel this way in large part because Aspyr is simplifying concepts I’m already familiar with. I’ve been playing Civilization VI (and Civilization in general) for years now, so there’s a lot of muscle memory involved. I’m not fully confident that a Civ virgin could pick this up and interact with it as easily as I do. That’s not so much because the interface is hard to understand; after all, this version comes with much the same tutorial we saw on the iPad, which makes the barrier to entry feel more like a hedgerow and less like the Great Wall of China. It’s more because everything’s so small. I always need to have my the brightness on my iPhone XS Max cranked to (ahem) the max run order to see all my units properly, and then I’ll sometimes still fail to see some knights and cossacks lurking in the shrubbery and landscapes. As with the iPad, it's sometimes difficult to select a specific unit, and in this case I can't even use the Apple Pencil for greater precision. Zooming in helps, but I don’t want to worry about that every turn. And if I feel this way—knowing what these icons represent—I can only imagine the frustration of someone playing Civilization VI for the first time. Good thing, then, that Aspyr made it so you don’t have to feel too bad about dropping $60 on an iPhone game (although Aspyr is selling it for a cool $23.99 at launch). If you already own the iPad version, in fact, you don’t need to buy this one. And if you do buy this one, it’ll work on your iPad. You can even transfer your save files between the two devices, but you'll have to do it manually as there's no iCloud save support. I’m particularly happy to report that you won’t be nickel-and-dimed to death with microtransactions. You’ll find six other scenarios and civilizations for everything from Poland to Nubia if you want them, but all of these $4.99 to $8.99 packs are entirely optional. For me, the civilizations included in the launch package are enticing enough. Although it'll be kind of cool to see if you conquer the world as quickly as Alexander did. So here's a couple of warnings: I never got to test the local-network multiplayer mode during my time with the beta (and no, there's no online option). I also didn’t get a chance to see how well it plays on a phone besides the iPhone XS Max, although the requirements say you should only play it on the iPhone 7 and above. Considering how much is going on in Civ at times, I don’t think that’s unreasonable. And I said at the beginning, I’m surprised it runs on the iPhone at all, even with our praise of the massively impressive A12 Bionic processor. Let’s hope this inspires other developers to bring more powerful games to the iPhone as well. But rest assured, even though you may need to look at the map a little too closely, even though you may struggle with the minimalized UI elements if you’re new to the series, this is still Civ. The layout may be different, but it’s as complex as anything you’ll find on the Mac or PC, aside from some concessions such as a lack of animations for world leaders during their pompous threats and brags in diplomatic cutscenes. It’s the latest iteration of one of the busiest strategy games of all time running in a device that fits in our pockets. Score one for civilization, I’d say.